I’ve been shamefully neglectful of this lovely little blog of mine. Fortunately it looks like a lot of you have still been coming around and leafing through the archives for some tasty seasonal fare. I wish I could promise there will be regular updates moving forward, but, the truth is, I’m just not sure. Life sends you down unexpected paths sometimes that steer you away from past passions (such as this blog). I’m doing my level best to recalibrate my course and get back to blogging about food, but it might take awhile. Please keep looking through those recipe archives in the meantime! On the eve of the year’s biggest food day here in the States, I figured I’d best put up a post to say hello. And since a local Philadelphia company sent me some samples a few weeks back that would make perfect holiday gifts for the foodie in your life, let’s talk about CHOCOLATE! To be more precise, let’s talk about the crème de la crème of the chocolate world right now: John & Kira’s. I’ve known of John & Kira’s for several years now since the company has graced several of the same farmers markets as has my own farm. Ironically though I’d never gotten to try a sample of their adorably cute chocolate ladybugs or other chocolate creations even though they generously give samples to many a market patron. I was always manning my own market table and didn’t have time to scoot over for a nibble. Lucky for me, they recently launched a new collection of chocolates called The Enchanted Garden and they asked me to review them along with a bar of their Mighty Urban Garden Mint chocolate. The Mighty Urban Garden Mint chocolate bar is indeed tasty, though the price tag is also a bit might at $9 a bar. The solace here is that John & Kira’s donates five percent of the sales back to the urban city gardeners and kids that grow the mint used in the bars. Seems like a nice way to donate to charity, don’t you think? To my surprise, I was sent two beautiful – I mean truly BEEUTEEFUL! 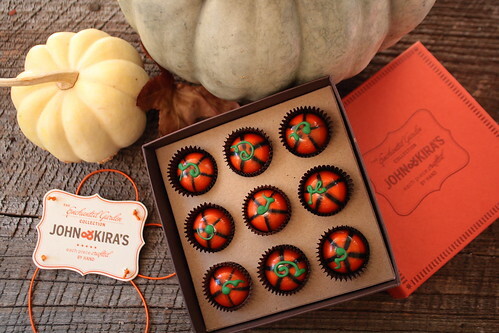 – boxes of chocolates: Spiced Pumpkin and Chocolate Cherries. The packaging along makes you feel like a million bucks. I felt a bit guilty as I dared to open them. The chocolates inside were equally stunning. 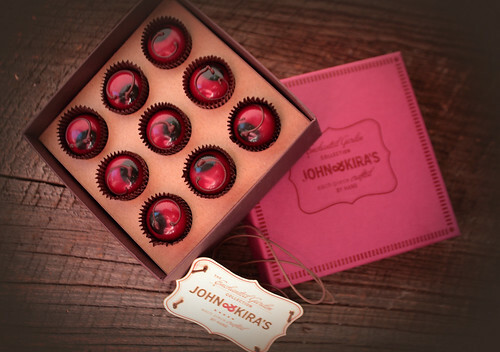 Each practically sparkled since John & Kira’s uses a glossy tempered chocolate to coat each confection. 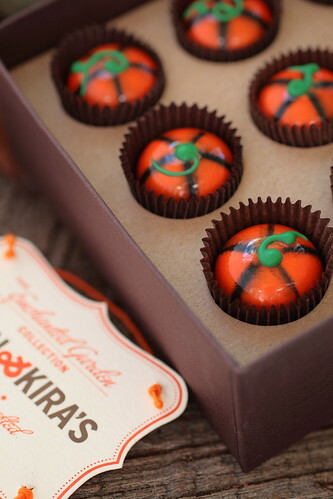 The “pumpkins” in particular were extra adorable as each had been given an individual curly-cue stem of green chocolate. Of course, I could hardly wait to take a bite, especially of the Spiced Pumpkin because I am a self-proclaimed pumpkin nut and creator of a decadent pumpkin pie truffle that’s just sensational (that’s not me saying that, I promise). So, I bit into a miniature pumpkin artwork and…I’m disappointed. Sorry, it’s true. I guess I just wasn’t expecting a filling that’s the consistency of loose pudding. And the flavor was 90% cinnamon when I had hoped to taste a good bit of the chocolate too (seriously, if you’ve never tried paring pumpkin with dark chocolate, you need to get on that right away). I know that pumpkin itself doesn’t have a lot of flavor so it’s about balancing the spices to evoke “pumpkin” in the taster’s mind. 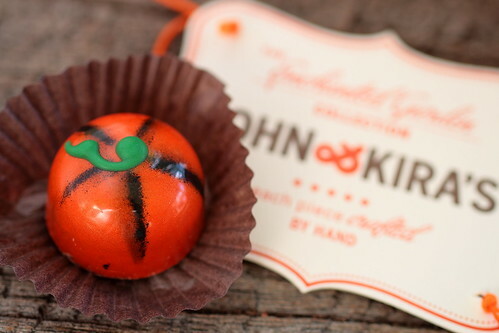 These glossy little pumpkin confections just didn’t find that balance for me. So, I moved on to the Chocolate Cherries with diminished spirits. See, I really hate the classic chocolate covered cherry. They are always too fake for me and something about that gelatinous ooze surround the cherry is quite disturbing. I assumed John & Kira’s was going to be just an artful version of that dime store standard. Hello, boys and girls, we have a winner!! 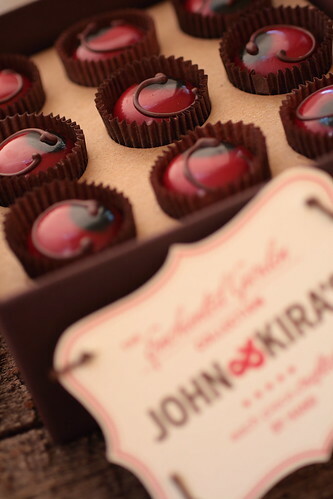 I was so surprised to bite into a John & Kira’s chocolate cherry and find it filled with a nearly smokey dark chocolate ganache (no ooze here) and a naturally sweet dried cherry instead of a sugary maraschino. After devouring that tasty treat, I finally bothered to open the catalog that came along with my lovely sample boxes and found out that there’s also some brandy mixed in with the filling for the chocolate cherries and that made perfect sense with what I was tasting. Yum! 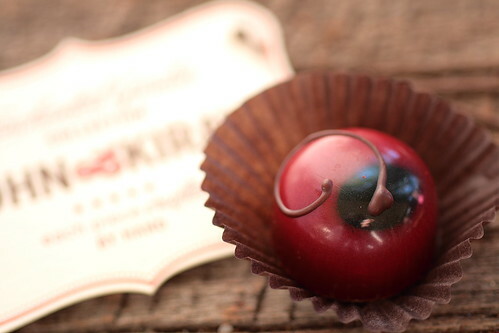 Chocolate Cherries (The Enchanted Garden Collection): Two Thumbs Up! 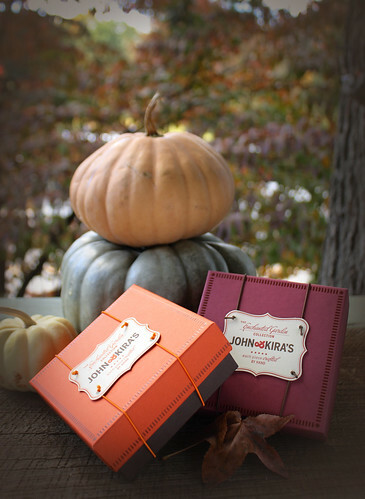 Before you rush off to place your order, you should know that John & Kira’s is not cheap. Seriously, really not cheap. But, as someone who now earns a living from my own creative work with a product that is largely considered a luxury, I know the value John & Kira’s is giving their customers. In addition to masterful chocolates, they are also a super socially conscious company that is striving to use as many locally grown and fair trade ingredients as possible in their confections. They partner with Philadelphia urban school garden programs in particular, a cause near and dear to my own heart. Like fine wines or cheeses, John & Kira’s is for the discerning palette (and wallet). Entry filed under: Extra Credit. Tags: food. Yes, I have missed you! Glad to hear you’re doing well with your business. These chocolates look amazing. Thanks for sharing your testing fun with us. You’re back! I missed you 🙂 I’ve seen John & Kira’s at farmers markets too and you’re right, their chocolate is beautiful! wow! !these are soo beautiful..they look delicious too..i should try them..
I’m glad you’re back online. I also sadly have been distracted this past fall. Love your homemade tea recipes – thank you for sharing! Looking forward to seeing them back on Etsy. hi! i just came across your blog through design*sponge and being that i live in the philadelphia area i was curious to see what your blog was all about. john and kira’s chocolate has a booth at my local farmers market as well and every once and i while i indulge and pick up something to bring to my boyfriend’s family. i have also found the chocolates to be on the expensive side, but i’m terrible at holding on to my money at the farmers market and want to support all of the stands. i have enjoyed the chocolate covered figs filled with chocolate ganache and some kind of liquor, and the chocolate orange peel rosemary garden bar, and the trail mix. the chocolates are sinful and i adore the packaging-that seems to be really thoughtful and pretty. i’m bummed to hear that those precious pumpkins weren’t amazing because they are so gorgeous, maybe they’ll rethink the filling for next year… anyway, i was pleased to come across this post! receive emails, so your fax messages are automatically delivered to whomever you intend.